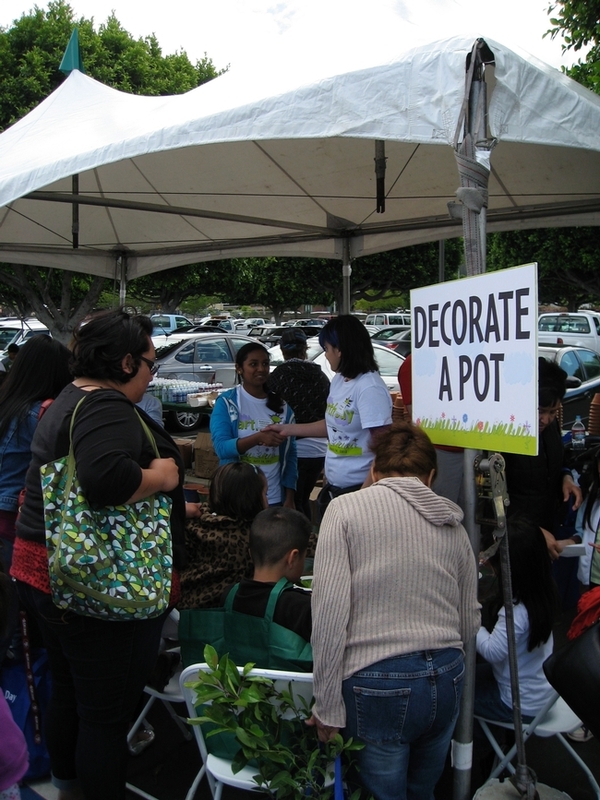 On Saturday, April 14, the Sanitation Districts of Los Angeles County held their annual Earth Day Festival in Whittier. Crowds of people, young and old, were waiting eagerly at the entry gate well before the start time of 10 a.m. Teamed with our fellow UCCE/Los Angeles County Master Gardeners—and located between the booths of Engineers Without Borders, OrangUtan Republik Foundation, and across from Friends of the Los Angeles River, we shared a table and white canopied booth and stayed busy, non-stop till 2pm, talking to people about their gardens and the art of food preservation. 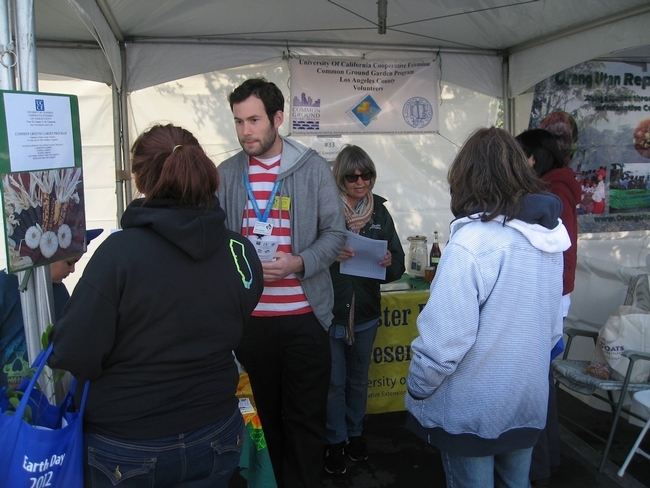 In all nearly 2200 people came through the Earth Day Festival and at least 500 of them stopped at our booth. On the MFP table we set out examples of dehydrated Meyer lemons, a large sample fermenting jar created by MFP lead instructor Ernest Miller, a smaller fermenter with sauerkraut nearly ready to eat, and a jar with salted preserved lemons that I’d made earlier in the week. 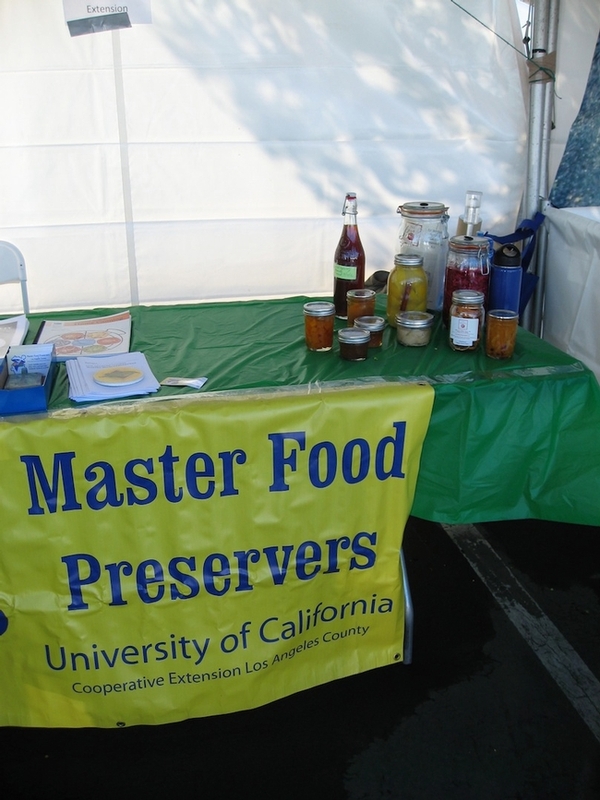 We also showed off jars of waterbath processed jams and marmalades, and pressure canned chicken and squash, which gave us a chance to explain how many methods of food preservation are available to the home preserver, along with tips for food safety practices. More than one person said "My mom or my grandma used to can everything but I never learned how to do it." We explained that our role as MFPs was to offer our services as volunteer instructors to teach them how to do it themselves. 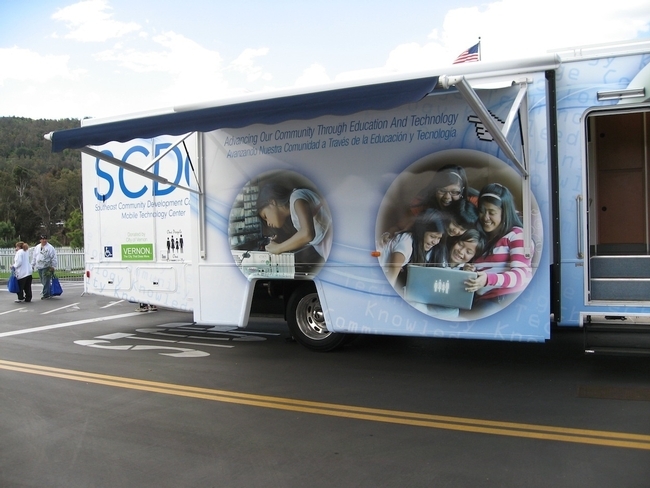 We asked them to bring word back to their organizations and let them know to call us if they wanted free lessons. On the Master Gardener table (we brought our own fold-up table) we offered seeds for foods that can be preserved, such as tomatoes, cucumbers, squash and herbs, and flowers for those who don't grow food. Sunflowers were very popular, as were cosmos and columbine. Attached to the veggie packets we stapled MFP cards so that people would connect the idea of growing, harvesting then preserving their veggies and herbs knowing they could contact us for the know-how. Families were out in force and many of the little ones were carrying around small plant pots that they had decorated at a special booth. Each pot contained a seed...some were given watermelon seeds, some had sunflowers, and of course we reminded them that these plants would need a lot more room than the cute pots they carried and should be transplanted as soon as they’re big enough. Different kinds of saplings were distributed by various agencies, and people were carrying them around the festival grounds, looking just a little bit like Johnny Appleseed carting his apple trees across the country. There was plenty of entertainment, especially featuring children dressed in colorful cultural costumes who sang and danced on performance stage. 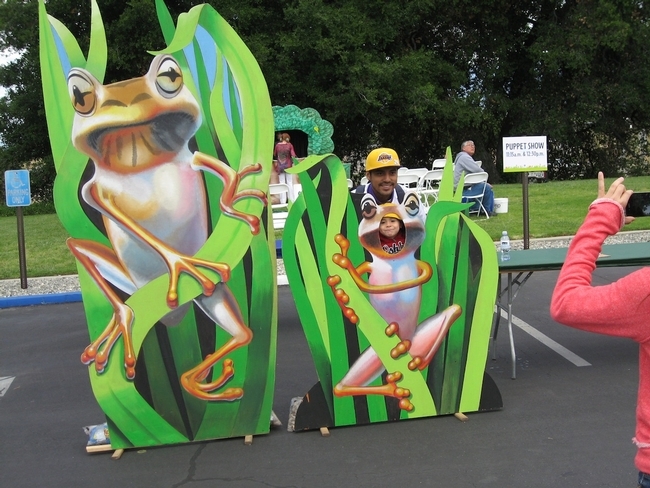 A makeshift theater tent showed films about the condition of our oceans; a large travel trailer invited attendees in for demonstrations on how to landscape with native plants; there was a puppet show, as well as costumed mascots for people to photograph. 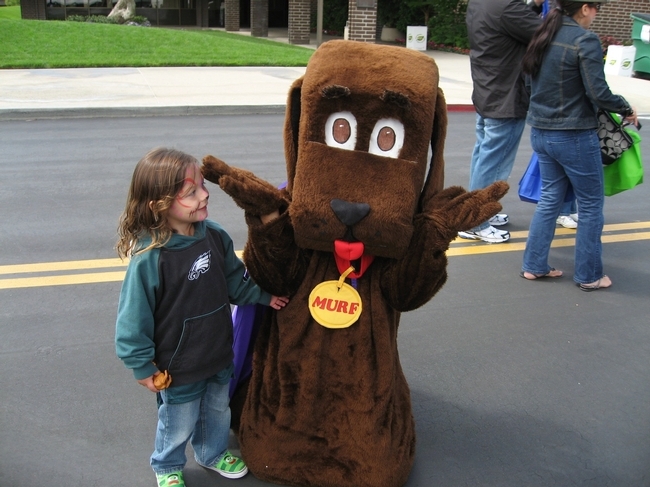 Murf, pictured here, represents the Puente Hills Materials Recovery Facility (MRF). By the time the day ended, our seed supply had nearly been cleaned out, we'd talked to many hundreds of people about food preservation, and we felt we’d had a very successful day.